I’m here today with a Technique Junkies July release stamp sentiment stamp called “Zen Waves”. My card started with a traditional watercolor texturized with salt background. Simply add any watercolor in a nice wet fashion on watercolor paper and apply large rock salt over the top. Let that dry completely, and brush of salt. What remains is a great texture. It reminded me of sand. 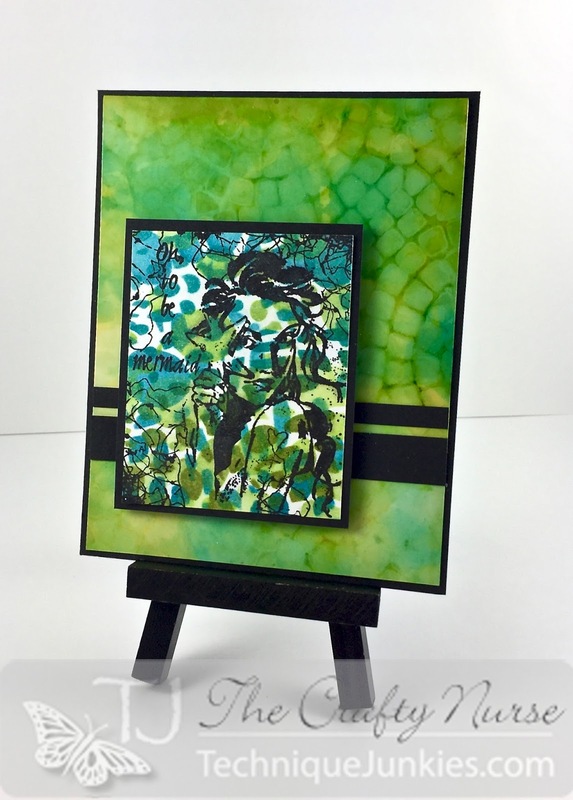 For the focal image, I stamped Zen Waves using Delicata Gold Glitz ink. I then cut out using a Lawn Fawn stitched die. I stamped “Beach Day” using the same gold ink and applied a few gold enamel dots. We are all over at the Technique Junkies Facebook Page so if you haven’t stopped by, we’d love to see you! We are getting ready for another fabulous release tomorrow and can’t wait to show off all the new stamps. Until then, you can find the July stamps at the Technique Junkies store. Happy Monday! Back with some inky inspiration today. My card today uses a gorgeous stamp from the July release stamps called, “Joy and Laughter SD777”. Use discount code TJ10Kathy for 10% off any stamps in the store. 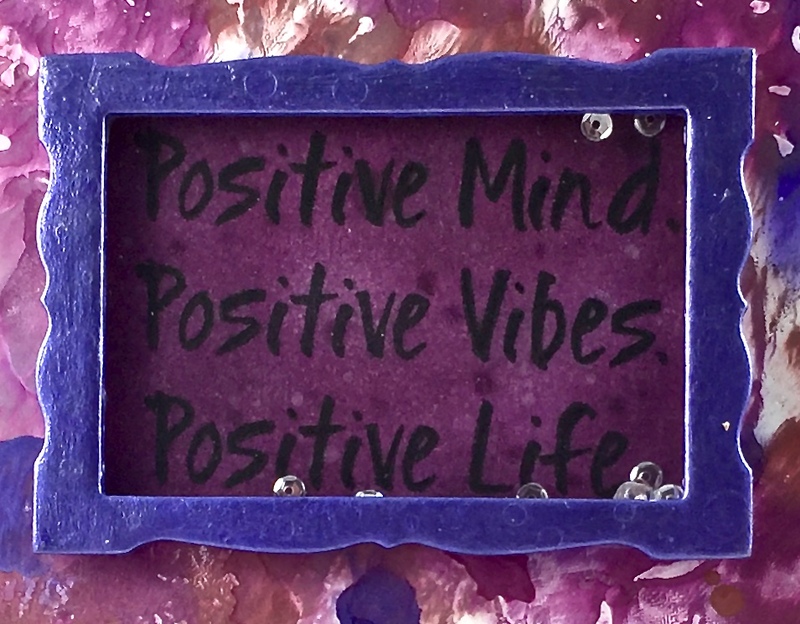 Have you seen the new stencils in the Technique Junkies store by A Colorful Life? So fun. I played around with the Circle Mosaic Stencil using the Alcohol Stencil and Grunged Stencil Tutorials on the Sensation Stencil CD. 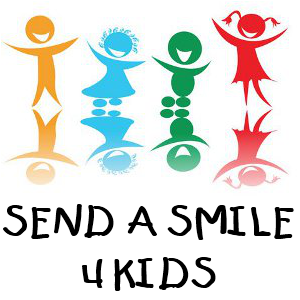 Join us over at the FaceBook Group to share your creative play. If you need more inspiration, check out our Pinterest page. Cards in Envy Challenge – Baby Blue or Pretty Pink? For this Cards in Envy Challenge we are providing entrants a choice of making a card that is either baby blue or pretty pink. By no means do you have to make a baby card, just choose either blue or pink on your card. Our challenges runs through Sunday, July 30th. As a quick reminder, Cards in Envy asks that you make your card fit into a standard A2 card, which is 4 1/4 x 5 1/2 inches. My card today features a Skipping Stone Designs stamp called “Bra’s #1”. I watercolored the bra using Picked Raspberry and Pumice Stone Distress Ink. The white background is a dotted embossing folder and the pink is stamped with a MFT script stamp in white ink and clear heat embossed. I finished off with a big ribbon to add more pink flare. 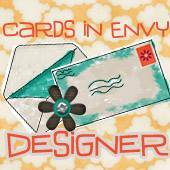 I hope you will join us at Cards in Envy this week and show us your choice of either Baby Blue or Pretty Pink cards! The Crafty Nurse here to share some inspiration for using a few of the new July Release stamps by Technique Junkies. 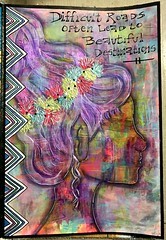 The technique is from Julie Ebersole using Dylusions Inks Sprays as watercolor. You have until July 9th to purchase the new releases at 15% discount. In addition, don’t forget to use discount Code: TJ10Kathy for other purchases. Thank you for joining me today. Please share your creations with us at the Technique Junkies Facebook group. We’ve also got the Technique Junkies July “Drip” challenge for you to enter until July 9th. If you enjoyed the inspiration, you can purchase your own stamps using the discount code: TJ10Kathy. Enjoy! The Crafty Nurse here with some metallic mid-week inspiration using a stamps from the July Release. You have until July 9th to get 15% off any of the July Release stamps. I don’t know about you, but as a true technique junkie, I have oodles of supplies. When I lived up in the New Jersey area I had the good fortune to go to the annual Ranger warehouse sale in Tinton, New Jersey. If you live anywhere near that area I recommend checking it out. They usually announce the sale dates for the fall event on the Ranger Blog and Facebook. Today, I’m using inks from one of my adventures called, Posh Rainbow Metallic Inks by Ranger. I applied them on my nonstick mat and dipped in. I love using this technique with Distress Inks too and Pat has the Distress Oxides in the store. The technique of dipping can be found on the Artistic Effects CD. 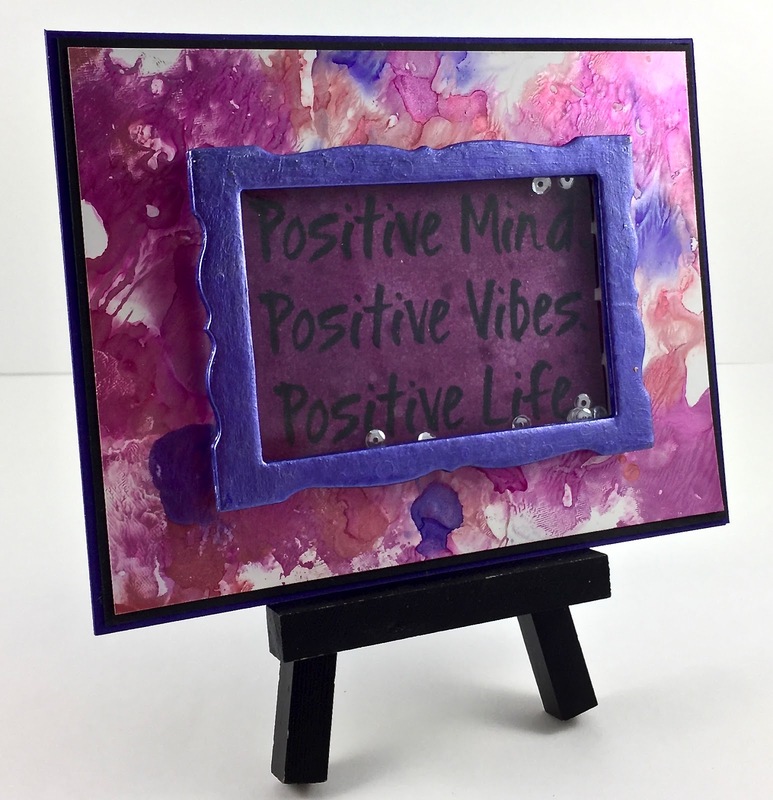 After creating a fabulous background I stamped “Positive Mind SD7809” with Archival Ink on a separate piece of card stock and applied Distress Inks in Seedless Preserves for color. To further isolate the sentiment, I created a frame using Recollections chipboard painted with more of the metallic inks. I popped up the frame with foam tape and added a shaker window. I’d love for you to share the cards over at the Facebook group using some of your supplies combined with Technique Junkies stamps. You still have time to enter the “Drips” challenge for a chance to win prizes. Need more inspiration? 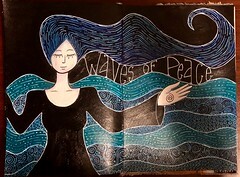 Check out the Pinterest board for Technique Junkies. Happy Monday! That means it’s time for a new Cards in Envy Challenge and this week we are celebrating the good old “Red, White & Blue”! Your card does not have to be patriotic, just needs to use those colors. Please make sure your card fits into a standard A2 envelope. The challenge will run through Sunday, July 16th and our design team will be choosing their favorite cards to feature on the The Cards in Envy blog. 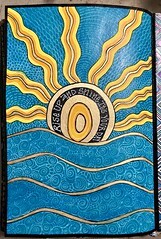 My card design was based off one from a favorite artist, Sandy Allnock. She is inspirational and has some great card making tutorials, especially if you like coloring. I look forward to seeing your Red, White & Blue cards this week! I wish all a safe and relaxing 4th of July filled with friends, family and fireworks! Technique Junkies July Blog Hop! Happy July 1st fellow Junkies! With summer here, the Technique Junkie Design Team is celebrating with a blog hop showcasing the new Technique Junkies stamps for July. Pat is offering 15% off all July Release Stamps for one week! In addition, you can use my discount code TJ10Kathy for your other shopping needs. WooHoo! I’d love for you to stop by all the design team’s blogs listed below for great ideas on how to use those new July Release stamps and post your creations over in the Technique Junkies Facebook group. Let’s get on to some inspiration! Supplies: Tombow Markers, Distress Inks, Art Anthology “Sterling Fairy Dust“, A colorful Life “Square Fade”, MFT Die. 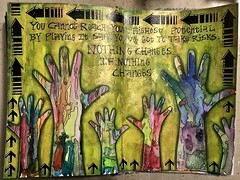 Supplies: Art Anthology “Cracked” Stencil, Stickles, Kaleidacolor Ink “Desert Heat”. Technique: Layered Rainbow Stencil Tutorial on Sensational Stencil CD. If you are arriving from Cheri’s Blog, your in the right place! Cheri, you rock! 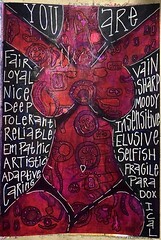 The next stop on this artsy tour is Jeanne Streiff! I sure hope you enjoy the Technique Junkies July Hop! Don’t forget – 15% off July Stamps for the next week only! 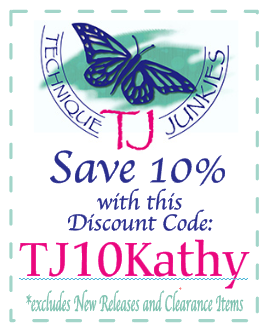 Also use the code TJ10Kathy for 10% off your other shopping.